So you’d like to hire a corporate magician to entertain at your corporate event. Here are 5 things to know! Before we begin, a little about corporate magician, Michael Kent: Michael is a comedian and magician from Columbus, OH who performs full-time and tours internationally year-round. While he may be known for performing in America’s colleges and universities, Michael has also performed several hundred shows as a corporate magician, entertaining prestigious groups like Disney, Citizen Watch Co., Bulova, Ernst & Young, AT&T, PwC, Honda, Pepsi Co., and hundreds more. 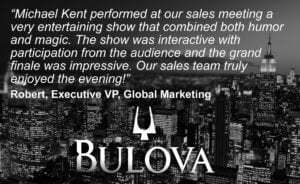 You can read just a few of the glowing reviews from these shows. After performing for The Columbus Zoo and Aquarium’s Annual Corporate Party for their employees, Famous Television Wildlife Advocate and Chairman Emeritus of the zoo, Jack Hanna, said to Michael, “You’re the best we’ve ever had! I’m proud you’re from Columbus!” Over the years, Michael Kent has learned how to deliver a show for the client that will leave them talking – 1) talking about how great the show was, but more importantly 2) talking about how great the event planner did in putting together a successful corporate event. When booking a corporate magician for an event, many people have no idea where to start. We hope that this guide will act as a starting-off point. There are 5 main considerations we’ll be talking about here: 1) Types of Magicians 2) Contracts 3) Expectations 4) Staging and 5) Event Flow. You obviously won’t be hiring a kids’ magician for a corporate event. Take a minute to think about the type of magician that your attendees will like the best. Here are a few different types of magicians that work great for corporate events (please note that some entertainers fit into multiple categories). We’ve included a couple non-magic types of mystery entertainers (mentalists and hypnotists) in this list because they are often considered along with magicians. a. Comedy Magician – This is a stand-up comedy style performance using magic. When it comes to the time of the show, you may not have a good idea of when the show would work best. Ask your magician if they have a suggestion. If you’ve booked a strolling magician, their performance may be much more dynamic and memorable during a cocktail hour than during dinner when people are distracted by their food. 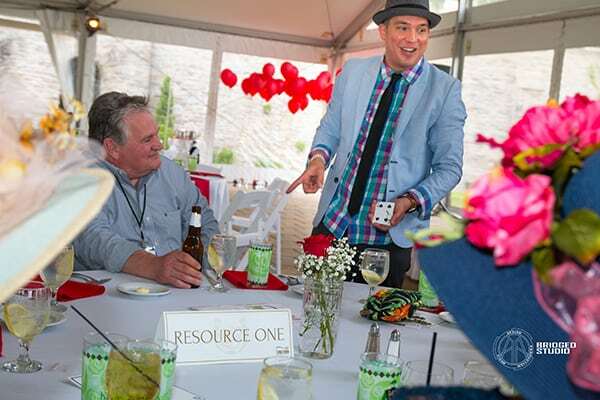 If you’ve booked a magician for a stage show at a sales banquet, it may not be best to put them onstage after an hour-long presentation by the company President. After-dinner entertainment is usually best just then – after dinner. As guests are finishing dessert, this is a great time to start the show. Then you can leave speeches and awards until after the show. The best length of time for a corporate magician to perform a stage show seems to be in the range of 30-60 minutes. The contract should state clearly the name and address of the event venue. If multiple events are happening at the venue, use the contract to let them know where your event will be held. Strolling Close-Up Magic – This is where a magician will mingle with your guests, entertaining small groups at a time with cards, coins, borrowed items, etc. This type of magic requires no staging, no amplification and no set up. It is most commonly billed by the hour. Stage Magic Show – This is exactly what it sounds like. It’s a show for everyone at once. This could be anything from a mentalist taking the stage with minimal props to a large-scale illusion show. Depending on the performer, staging, audio and lighting may be required for this type of show. Combination Show: This is the most common type of service that Michael Kent provides when hired as a Corporate Magician. It’s common to have Michael perform close-up strolling magic during a cocktail hour and then a stage show after dinner. It’s important that this part of the contract reviews what the payment terms will be if the event is cancelled or postponed by EITHER party for various reasons. Make sure that there is a policy for inclement weather! Sometimes there are unavoidable reasons that may result in the cancellation of a show. Michael Kent has only had to cancel 2 shows. One was because he was in the hospital, the other was because the airplane was routed to the wrong city! In both cases, the contract dictated how this should be treated. This is commonly done through an addendum to the contract, called a Rider or Technical Rider. Michael Kent’s rider for colleges and theaters is 4 pages of very detailed guidelines, because we want the show to be as good as it can be. Our rider for corporate shows is a little smaller because we understand that many corporate events take place in hotel ballrooms and conference centers where amenities like theater-lighting and backstage dressing rooms may not be available. The technical requirements part of the contract should always be a negotiation and is very rarely something that makes or breaks whether or not a show can be booked. Communicate to the entertainer what you expect out of the evening. Do you want a show that they’ll talk about forever? Do you want a unique way to introduce a theme, concept or product to your audience? Also be sure to tell your entertainer what the dress code is for the event. Michael once performed a Sunday show for a very prestigious group only to find out the day of the event that it was a black tie formal affair! Luckily, he was able to find an open tuxedo shop at the last minute. Another consideration here is to discuss with the entertainer the rating of their content. Do your guests want a PG-13 show or a squeaky clean G-rated show? Tell this to your entertainer ahead of time! Do not put the dance floor in front of the stage. empty space between the performer and the first audience members, this “dead space” totally kills the vibe. There will be less applause, less laughter, less attention and the result will seem like the audience is not enjoying the performance. In reality, it’s not as easy for them to feel engaged with the performance. Don’t be afraid to put those front tables right up next to the stage. If the dance floor is permanent, put them right on top of it (if you’re planning on having dancing later, you can have the staff break down those few tables). Encourage people to sit near the stage by offering prizes to those who sit in the front tables. ntertainer in the brightest part of the room. It’s important that everyone can clearly see and hear the act you’ve spent your money and energy on. Michael has performed at a few corporate events in which attendees were ushered into a special “performance space” for the show. Every single one of these shows has been a huge hit. Why? When people are ushered into a special “show area,” you’re setting their expectations. They’re there for a show. There are less distractions by food, drink and conversations. It feels like you’re doing something special for them by “inviting” them to a personal performance space. As a result, the audience members become more invested in the performance you’ve brought to them. The evening’s agenda is important to settle, but more than that, think about how you want to event to feel. Think about the entire evening as if it were a movie. It needs a strong beginning that keeps the guests intrigued and interested, and considerations of the energy level throughout. Is there part of the evening in which you expect a lull? By expecting that, you can defeat it with roving entertainment, music, games, etc. Many events completely lose their “mojo” when the CEO gets up to speak. Some people are great speakers and motivators. Others aren’t. One GREAT way to handle this is to follow up a speech with a heartfelt video. Lots of company events use door prizes or raffles to keep people interested until the end. Please keep in mind that, while this is a good way to keep people from leaving early, it also leaves most of the attendees disappointed that they didn’t win. If there’s a giveaway or gift bag that every attendee gets, consider keeping it a surprise until after all of the door prizes have been awarded. That way everyone leaves feeling like they’ve won. There’s no way that this list is comprehensive, nor is it meant to be. But these are the 5 most important things to consider when planning on booking a corporate magician. As always, please feel free to contact us with any questions you have and we’d be happy to help!